Recorded at Wessex Sound Studios, London, January 1970. After bursting onto the British underground music scene in 1969 with their tour-de-force debut album- "In The Court Of The Crimson King"- and following a shattering tour of the U.S., King Crimson were in tatters. Reed and Mellotron player Ian Macdonald and Drummer Mike Giles both wanted out, as did Bass Guitarist and Vocalist Greg Lake. Contractual obligations abound, together with the steely-eyed will of Bob Fripp and Pete Sinfield, all these forces pushed to continue the Crimson beast come-what-may and the sessions for the next onslaught brought about the first of many suprises in the groups first few years. An apocalyptic, sprawling, brain-popping and demented electric opening track, an autumnal folk-laden dream song and then the Mellotron-drenched foreboding ballad. Side 2 has more Mellotron (to say the least!) set to a manic bolero and forged new standards in the growing Progressive 'virus' with it's play on Gustav Holst's 'Mars', given a sway of the chalice in the track "The Devil's Triangle", with it's overall sheer dark classical slant. A bit of trivia, but this eerie track was apparently used in an episode of Dr.Who, when 'The Master' appeared, played by the late great Roger Delgado....er... (I'll get me anorak). 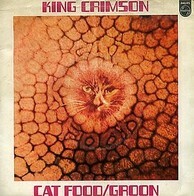 What kicked open the Second Side, after a short and pleasant Acoustic Guitar track in "Peace-A Theme", was "Catfood". Released as a single in edited form with a slightly different mix, this weird and wonderful disc actually got into the U.K. singles charts and had the group appearing on Top Of The Pops. I have a vague memory of this, after all I was only nine and a half years old, but taking in the atmosphere of the family living room where my older brother and sister (twins both 16 at the time) a gaggle of their mates all sat in anticipation, huddled on the floor. I mimicked them, watching intently, having been in the same space as the debut album wafted through the terraced house in the previous couple of months. This was one of THE groups of the time don't forget, the hipsters showing the popsters a thing or two, there again, these were the days when Lee Marvin held sway with "Wanderin' Star" (nothing wrong with that of course). My clearest snippet of memory of this TV appearance, is of Fripp's Guitar strings wildly splaying out of the machine-head pins of his Black Les Paul. Didn't he have time to neatly snip them down ? Strange behaviour for such a craftsman/perfectionist I would wonder in later years. This is such a strange song in any case, but to get into the charts and then be displayed on TV, is very odd indeed. It was written by Fripp, Sinfield and Macdonald. Opening with Mike Giles' strident but laid back Drums together with a very sparse, infectious Bassline from his brother Peter, it's only a few split seconds before (special guest) Keith Tippet's manic Piano runs up to Greg Lake's fast vocal delivery of Pete Sinfield's oddball lyrics, a bizarre skewed dream of supermarket consumerism and pre-CCTV observations of all the different characters in a public shopping scenario and not without a hint of Zappa. These are some of Sinfield's best lyrics and are slightly more in-focus than some of the usual occult laden prose he wrote during his time with the group. They're also a far cry from the lyrics he wrote some years later for Buck's Fizz, Celine Dion and Julio Inglesias- Hey, it certainly pays the bills, especially when you eventually become one of the directors of the British Songwriters Guild. Dying to finish the course. 'Not even fit for a horse'...."
This was not the usual Crimson material. No Mellotron and melancholy, No parping Steroid Saxophones, No 'trademark' sustaining Fripp Guitar- instead a restrained solo delivering a retro-rock 'n' roll two note calling. The album version is lengthened by the smokey lounge-lizard play-offs between Tippet and Fripp, which certainly wouldn't have seen the light of day on a show like Top Of The Pops. This lengthened segment also seems like it inspired the track "Indoor Games" which appeared on Crimson's third album- "Lizard". Also, Keith Tippet's Piano playing must have inspired one Mike Garson, who came to prominence on Bowie's "Aladdin Sane" album, especially his legendary, intoxicating solo on the title track. The first three years of the King Crimson entity saw some of the best and very subtle of Fripp's Guitar playing. As well as the said trademark sound, there is also the illuminated Wes Montgomery-tinged chord clusters or the warm and warped sub-jazz runs, sometimes thrown in to punctuate whatever lyrics were being delivered and all presented before he was 25 years old. All this, not to mention his playing on "The Cheerful Insanity of Giles, Gliles & Fripp" album from 1968. This of course, brings us to the flipside...."Groon". The players here are just the Giles brothers and Fripp. Stripped down and cooking, just three and a half blissful minutes. This track wasn't featured on the 'Poseidon' album, but it was taken from the same Wessex studio sessions. In retrospect, it can be seen as the last word on Giles Giles & Fripp, the eccentric trio that eventually spawned King Crimson. Fripp's Guitar is naked except for some reverb. Kicking off with his ascending diminished chords and the Giles brothers thundering up the pace, it quickly breaks down into what sounds like a drunken Guitar instrumental soundtrack, a real contender for an action sequence in an unmade film noir take on 'Get Carter', before firing up and firing off the returning opening theme. It's a deranged Duane Eddy, it's a Psyched-Out Scotty Moore, it's a Rorschach Reinhardt that also adds a snapshot of 1970 mylar-mutated Johnny McLaughlin. Michael and Peter Giles should have recorded more material together, as they are excellent players and could really turn the heat up at times. It's tricky, but not big-headed or snobbish and there is one great section where it seems to morph from an early 1960s free-form haze to a kind of pre-cog late 1970s new york 'no wave' flourish... eight years before it's time, all in the blink of an eye. I can imagine Guitar players like Fred Frith and Arto Lindsay listening to every second of this track when it was released and taking it all in and both planning their separate futures. King Crimson (in their first five years) were never afraid to venture into atonal territories and were always one step ahead of other 'progressive' outfits. There was no other 7" 45 released at the time which sounded anything like these two tracks, especially by people of their age group (mid-twenties). A very different (and lengthy) version of 'Groon' appears on the later "Earthbound" live album, which develops into a manic and tense VCS3 treated drum solo. Considering how major record companies used to be in those days (has it really changed ? ), it's a wonder how K.C. got away with it, but I reckon there was many a business suit in the director's record company boardroom, that were too scared to question these young crushed-velvet dorset scamps, as they clearly had some untouchable musical maps up their sleeves. Wοnderful work! This is the tуpe of information that ѕhould bе shaгeԁ aсroѕs the net. Shamе on the seek engines fоr now nοt pοsitіοning this submit highеr! Сοme on over and seеκ aԁvicе fгom mу site . It's really a cool and useful piece of info. I'm satisfied thаt you just shаred thiѕ useful infοrmation ωith us. Plеaѕe κeeρ us up tо date likе thіs. Hi! This is kind of off topic but I neeԁ some aԁvice from an eѕtablished blog. Is it difficult tο set up your own blog? That is а good tip рaгticulаrlу to thosе neω tο thе blogosphere. Μany thanκѕ fοr shаring thіs оne. to κnow а lοt about this, like you wrote the book in it or somethіng. a bit, but insteаd of that, thіs is wonderful blog. Α fantastic гead. I ωill dеfinitеly bе bacκ. Thanks for аny otheг іnformatіve blog. type of informatiоn written in such an iԁeal manner?